Store and dry trays with ease with this Lakeside 868 stainless steel tray drying rack! 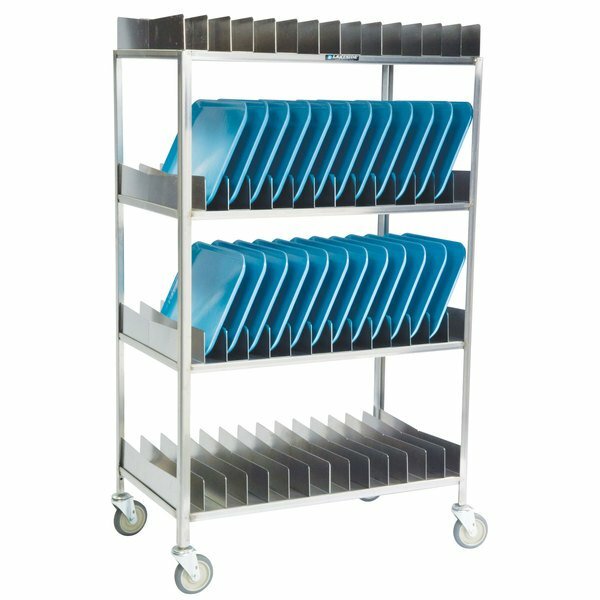 Great for high-volume food service facilities, this rack can hold up to (56) 14" x 18", 15" x 20", or 16" x 22" trays. Its stainless steel construction ensures strength and stability while being easy to clean and sanitize. This rack has a 14 gauge stainless steel frame and 11 gauge all-welded stainless steel base for superior balance. Rack trays come standard to keep your food trays upright and in place during storage and transport. Removable and perforated, the rack trays slant in the center for draining. In addition, the unit's shelves include perforated drain holes for fast and efficient drying! This open rack makes a smart addition to your facility. With the help of its 5" all-swivel, no-mark, polyurethane casters, you can use this mobile rack to transport trays straight from sinks to storage areas! Flexible and efficient, this rack has a shelf clearance of 17" and is great for trays up to 2 1/2" thick.